Lost something during the festival? The room has an exceptional accessibility: proximity of the ring, the main highways, the airport, the South Station and Central Station combined to an exceptional offer of transport: 4 tram lines, 3 subway lines and 3 bus lines. This added to its strategic location and its reputation among different Belgian linguistic communities and internationally offer extraordinary potential. From “la gare du Midi” station, take the direct metro line 6 direction Roi Baudouin. Get off at Heysel. This will take about 15 minutes. If you are coming from Amsterdam or Luxembourg, you can reach BRUSSELS EXPO by getting off at Brussels Central Station. Take metro line 5, bound for Erasme. At Beekkant, take line 6 bound for Roi Baudouin. Get off at Heysel. This will take about 20 minutes. You can also take line 1 at Brussels Central Station, bound for gare de L’Ouest. At Beekkant, take line 6, bound for Roi Baudouin. Get off at Heysel. This will take about 20 minutes. 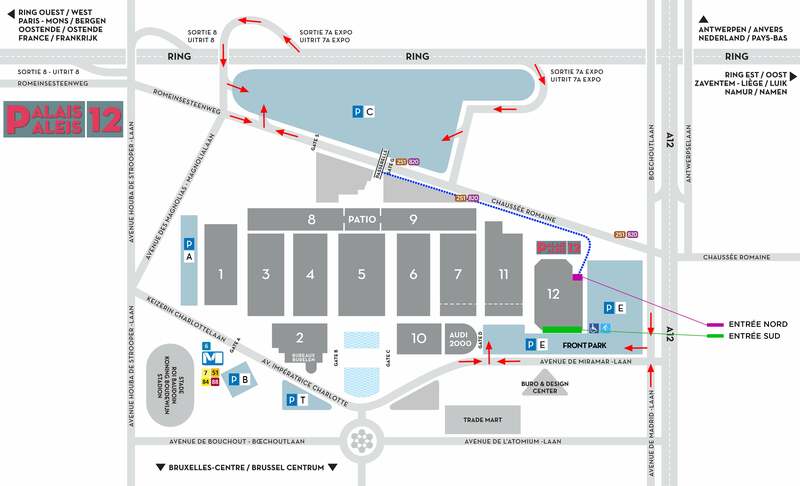 Follow the Ring R0 bound for Zaventem – Namur (Namen) Take exit 7A on the ring road and follow the “Expo” signs. Take the Ring R0 bound for Ghent-Ostend (E40) Take exit 7A on the ring road and follow the “Expo” signs. Follow the Ring R0 bound for Ghent-Ostend (E40) – Mons (Bergen)/Charleroi Take exit 7A on the ring road and follow the “Expo” signs. › Come light to facilitate the entrance! There is no accommodation at Palais 12.